Continuing the X4 Series (not an X4 though since for Quotas we’re only concerning ourselves with a traditional production and DR setup). It is not directly possible to synchronize Quota Rules from source to destination, because you cannot create a Quota Policy Rule on a Read-Only volume. 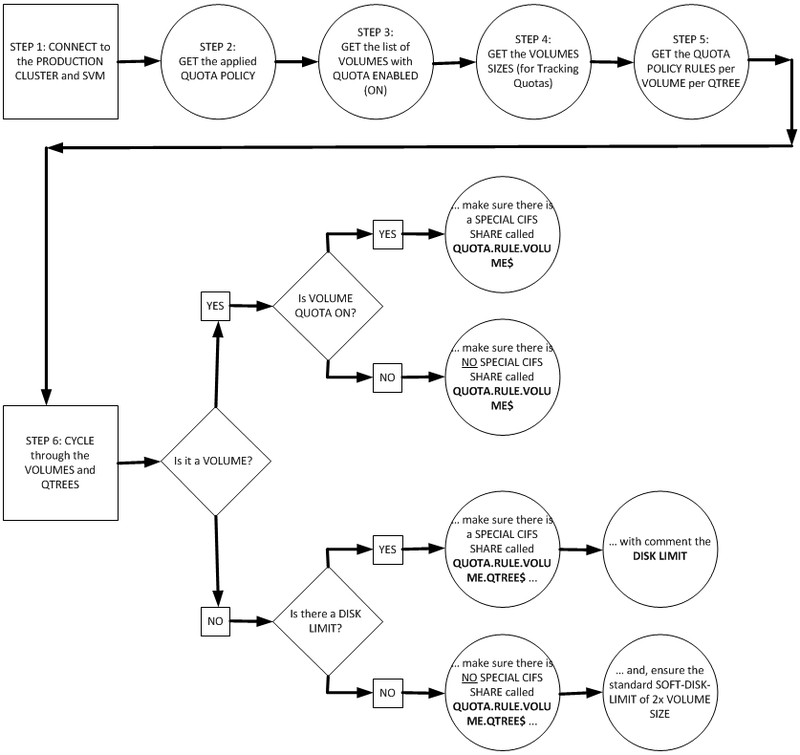 If you are thinking you can break the mirror, set the Quota Policy Rule, and then resync - like we did in the previous post for applying an export policy to a destination Qtree - that does not work, the Quota Policy Rule disappears from the policy. The answer is to use CIFS share comments (Qtree comments do not exist at least not in CDOT 8.2.1/2). Essentially, for each volume with Quota enabled, and qtree with Quota policy rule, we create a specially named hidden CIFS share, and in the comments we can store details of the Quota. We’re already synchronizing CIFS shares (see Synchronize-CifsX4.ps1), so all we need is a tool that creates these special CIFS shares with comments for Production, and another that can extract the information and apply in DR.
And the tools are the PowerShell scripts posted in Parts 2 and 3. The below diagrams detail the workflow these scripts use. Note: If you’re thinking all this seems like a lot of effort, 8.2.X doesn’t have a Vserver/SVM DR like 7-Modes vFiler DR.
5: If Quota on the Volume is turned off we assume there are no rules to care about. In script planning stages I drew the following workflows. These workflows are not exactly how the scripts turned out, but they’re a useful guide to what we’re trying to achieve (I’ll hopefully update them when I get around to it).